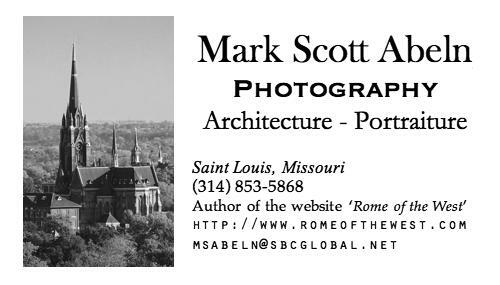 PHOTOS FROM a night walk along Grand Boulevard, near the Saint Louis University campus, in midtown Saint Louis, Missouri. 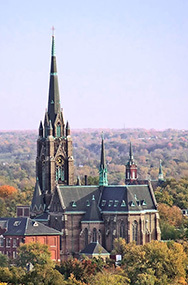 DuBourg Hall of Saint Louis University. 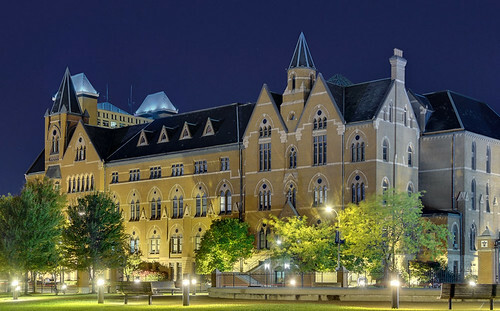 Completed in 1888 and designed by Thomas Waryng Walsh, this was the first building on SLU's Midtown campus. The original Gothic interior has been heavily modernized. The Continental Life Building, designed by William B. Ittner and completed in 1930, was once a very desirable business address; but with urban decay it was abandoned in 1974. It was restored and reopened in 2001. 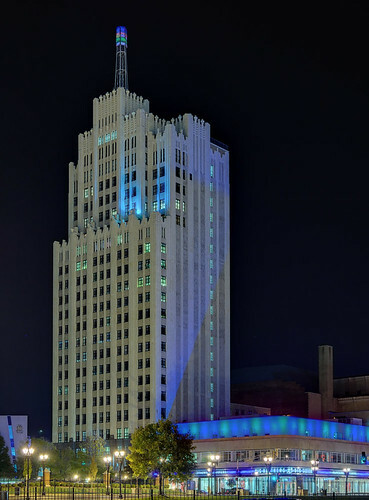 The beacon atop the building features changing colors. Saint Francis Xavier Church. 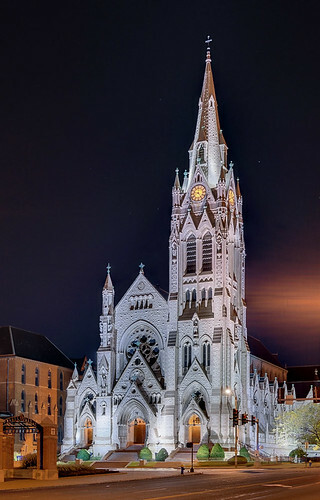 Construction started in 1883, and like DuBourg Hall, this church was designed by Thomas Walsh, and is modeled after the Cathedral of Saint Coman, in Cobh, Ireland. The interior was reordered in the 1980s. 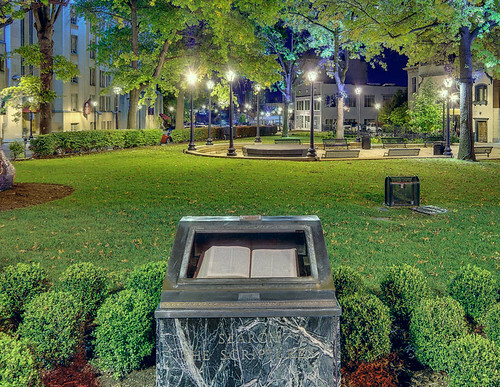 Due to a severe mix of electric light types in these photos — including monochromatic sodium vapor lights — coupled with camera and post-processing limitations, the colors portrayed in these photos are only approximate at best, and should be taken with a grain of salt. 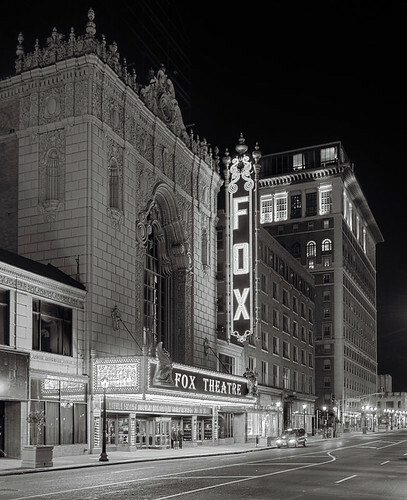 The Fox Theatre was designed by C. Howard Crane, and opened in 1929, during the Golden Age of Hollywood film. This large theater features an elaborate Burmese-Byzantine hybrid interior. It closed in 1978, and reopened several years later after an extensive reconstruction. As the colors in this original photo were not even plausible, for the reasons given above, I converted it to black and white. A better photo could be captured during dusk. This monument features an open Bible, turned to one of Saint Paul's letters to the Corinthians. It was placed here by Lutherans in 1951. This is in a park opposite from the Fox. 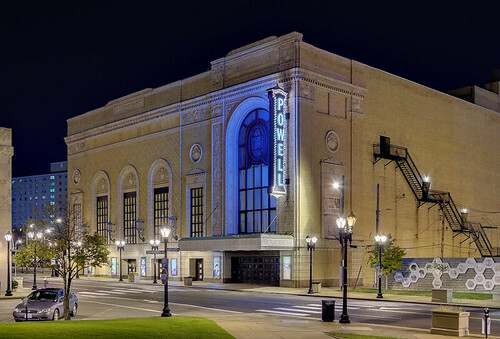 Powell Hall, home of the Saint Louis Symphony Orchestra. This was formerly the Saint Louis Theater, designed by the Chicago firm of Rapp & Rapp, and opening in 1925. It has been the home of the orchestra since 1968. The stained glass window over the entrance depicts Saint Louis IX, King of France. 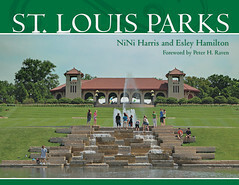 In the 1920s, Midtown became Saint Louis' premier entertainment district, replacing the old ‘Electric Avenue’ downtown, located at what is now the football stadium. For a 1954 photo of the Midtown theater district, click here. Tower of Saint Alphonsus Liguori Church, also designed by Walsh. 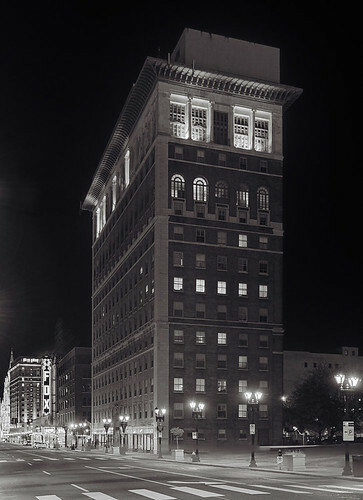 The old University Club Tower, dating from 1917. This is not to be confused with the newer University Club Tower, completed in 1975, which is located in the suburban Saint Louis County community of Richmond Heights. The Club itself folded in 2007 after struggling for a number of years. 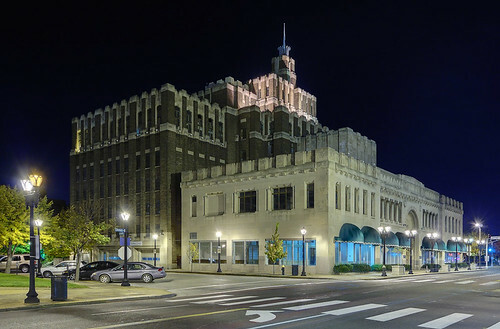 The Carter Carburetor Building, located across the street from Powell Hall. Built in 1928, and originally the home of the Knights of Pythias (a fraternal secret society charted by the U.S. Congress), this building now appears to be vacant. It is also known as the Beaux Arts Building. 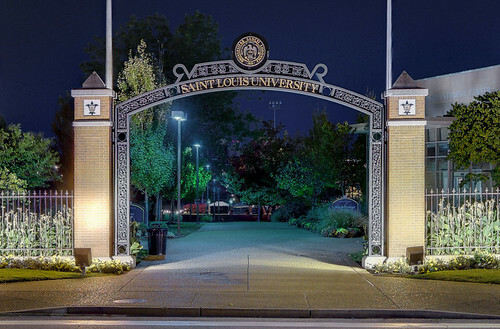 An entrance gateway to Saint Louis University. 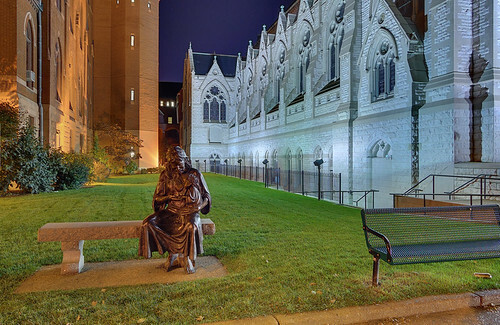 Decorative gateways and fencing were added to the SLU in recent years to both beautify and secure the campus. Statue of the Sacred Heart of Jesus, next to Saint Francis Xavier Church. It is entitled Cor ad Cor Loquitur (‘heart speaking to heart’), and is by artist James Michael Maher. Wonderful! It's so interesting the way lighting affects colors. DuBourg Hall, for example, is truly red brick, but in the first photo looks almost tan. I love the crispness of your work. Yes, the colors are very problematic. I would someday like to borrow an astronomer's deep sky filter, which subtracts out sodium vapor lights. That would allow me to capture more realistic colors for night shots like these. I love the photos! Thank you so much for this. I particularly enjoyed the history on Carter Carburetor. Very interesting.